Sometimes two separate technologies go together so well, that you wonder why nobody thought of combining them before. This is true with the Sony HDR-PJ30VE – a camcorder that has an in-built projector. Yes Nikon stole Sony's thunder with the launch of its projector camera but this is the first time we have seen such a thing on a fully functioning camcorder. Sony has done well to get the pico projector inside the HDR-PJ30VE. 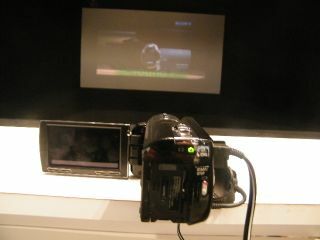 The projector is actually situated on the front of the viewfinder and offers up a projection size of 60 inches. The projector isn't actually that bright, though, at 10 lumens but it seems to do a decent job when you project an image into a smaller space. The actual resolution of the screen is 640 x 360 and you can throw the image in as short a distance as 0.5 metres. The use of the projector does run the battery on the camcorder down, so you will be lucky to get an hour's viewing out of the thing. But this is plenty of time to bore all with your 'amazing' holiday video. As for the rest of the camera specs, you have 30x optical zoom, MemoryCard and SD card slots and 16GB of Flash memory built into the camcorder. UK release date and pricing for the Sony HDR-PJ30VE camcorder is still to be announced – the US has it priced at $699.